If you have a blood pressure related health problem, you need to stay on top of your blood pressure numbers. In fact, your life may even depend on how well you pay attention. If you’re on medication, you need to record accurate blood pressure readings. Without good data, there’s no way for your doctor to know how much medicine to give you. Failing to keep up with the data could be a fatal mistake. Around the world, high blood pressure is responsible for 12.8 percent of all deaths. According to the Center for Disease Control, 1 out of every 3 Americans have high blood pressure. Fortunately, those in need of a blood pressure monitoring system have lots of different options. Today’s best blood pressure monitors are inexpensive, accurate, portable and discreet. Upper arm style. Most doctors use an upper arm style monitor to take your blood pressure. That’s because arm cuff blood pressure monitors are very accurate. However, some are bulky and uncomfortable compared to other blood pressure monitoring devices. Wrist style. Wrist blood pressure monitors are significantly smaller and more discreet than upper arm style devices. The technology is continuing to improve, but overall wrist blood pressure monitors are still not quite as accurate as upper arm blood pressure monitoring devices. Manual. Old-fashioned manual blood pressure monitors (aka sphygmomanometers) can be very accurate– if they are calibrated correctly. Manual blood pressure monitors tend to be cheaper than their digital counterparts. Another benefit is that electricity is not required. Digital. Automatic digital blood pressure monitors are capable of self-inflating. Some can even upload info to the internet or to a smartphone. Of course, in order to run a digital blood pressure monitor you’ll need a source of electricity. Most digital blood pressure monitors run on batteries, but some come with A/C adapters. How complicated is it? If you’re tech savvy, you may feel comfortable using a smartphone compatible blood pressure monitor. But if not, then you may be better off with a simpler product. Most feature-rich digital blood pressure monitors are complicated compared to simpler types of blood pressure monitoring machines. Will the cuff fit? Upper arm style blood pressure monitors are usually– but not always– adjustable. If your arm is too big or too small for the cuff, you won’t be able to use it. Most manufacturers list the size of the cuff on the side of the box. If you’re buying via the internet, check the product’s Amazon page or the manufacturer’s website for size info. What’s the procedure? Some types of blood pressure monitors require you to move your arm in certain ways as you take a measurement. For example, some wrist style blood pressure monitors necessitate moving your hand toward your heart. If you’re not consistent in the way that you measure, you won’t get accurate results. Other types of blood pressure monitors don’t require any special movements. In recent years, researchers have discovered a few interesting ways to lower your blood pressure using natural methods. All of the techniques listed below are totally safe. So if any of these ideas sound appealing, feel free to try them out– and don’t forget to use your blood pressure monitor to record your results. Get some sun. Researchers at the University of Edinburgh found that people exposed to the UV rays experienced a significant blood pressure drop. Meditate. According to the American Medical Association, meditating for just a few minutes can help you let go of stress and reduce blood pressure issues. Hug somebody. Some scientists believe that there could be a link between physical affection and blood pressure. A recent study in the journal Biological Psychology revealed that women who often hug their husbands have lower blood pressure compared to women who dislike physical contact. Dance. According to a report published in the Journal of the American Society of Hypertension, aerobic dance therapy reduces the number of antihypertensive drugs needed to achieve blood pressure control. Are you looking for a cutting edge blood pressure monitor that can send your health stats to a smartphone app? Or, are you looking to buy a monitor for a relative who can’t see so well anymore? Our “best of” list has a little something for everyone. Read on to discover the top 6 blood pressure monitors of 2017. 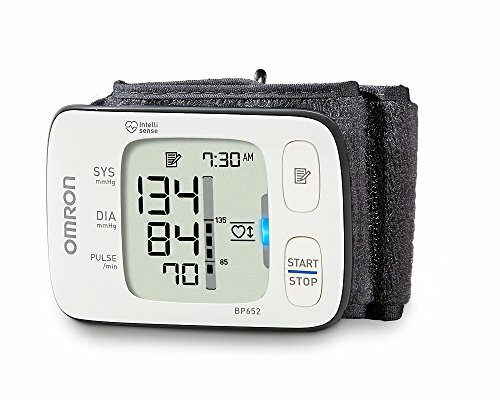 Those who are looking to purchase a blood pressure monitor without spending an arm and a leg may want to consider the Omron BP742N 5 Series upper arm blood pressure monitor. This monitor comes from a top brand, and makes it fast and easy to obtain accurate measurements. Considering its moderate price bracket, it is surprisingly feature-rich. There are some quality control issues with accuracy. Some units have been sold which appear to produce inaccurate readings. This seems to be a common issue with blood pressure monitors for home use (regardless of brand or model), so just be sure to calibrate yours before use. Thankfully most BP742N 5 monitors do not suffer from this defect. Overall, BP742N 5 is one of the top values on the market right now when it comes to home blood pressure monitors. It is significantly less expensive than many competing products, yet offers an abundance of impressive features. It also is a fabulous choice for ease-of-use. Looking for a blood pressure monitor which offers precision, consistency, and an array of deluxe features? Consider the Omron 10 Series blood pressure monitor BP785N 10. The BP785N is designed to fit on the upper arm, and offers simple, one-touch operation for accurate readings time and again. Take accurate readings with TruRead™. This technology allows the monitor to take three readings consecutively. The average of the three is calculated automatically to give you the most accurate reading of your blood pressure. You can turn this feature on and off as desired. ComFit ensures correct positioning. This monitor can fit on arms with circumferences ranging from 9” to 17”. ComFit technology ensures that the monitor inflates evenly. This in turn means positioning is accurate. The large display is easy to read. The display is backlit and includes green and orange indicator lights. You can see at a glance if your reading is a healthy one. Plenty of storage is offered. You can save as many as 200 readings in the device’s memory bank. Multiple power options. You can use an AC adapter (included) with this monitor or 4 AA batteries. Power use is very efficient, so your batteries should last you more than a month even with daily use. Great value. This monitor is close in price to some others in the Omron Series, but offers significantly more features. The device’s lifetime may not be that long. Some blood pressure monitors in this series have been known to quit working within a year. Sadly this is a common issue with blood pressure monitors in general (not confined solely to this model). This deluxe blood pressure monitor combines ease-of-use and rich features into one elegant package. So long as you are using the Omron BP785N 10 properly, you should be able to get consistently accurate readings. 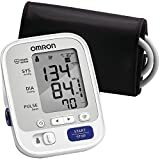 Omron’s BP652 7 is one of the most comfortable and portable blood pressure monitors out there right now in the wristband style blood pressure monitor category. The BP652 is ultra portable, discreet and accurate. Inflates automatically for highly accurate readings. All that’s required to get a reading is a single button press. The wristband quickly fills with air and checks your blood pressure. It’s totally silent. Some wristband style blood pressure monitors make a lot of noise when they inflate, but this one’s very quiet. It looks like an ordinary wristwatch. Some blood pressure monitors are bulky, but this one is compact and portable. Review your blood pressure history with ease. This blood pressure monitor stores your health info to memory. The instructions are confusing and hard to understand. There are several wristband style blood pressure monitors on our list, but the BP652 7 is the smallest, most discreet option. The only downside is that the included instructions are poorly written. However, those who figured out how to use this device properly were pleased with the results. It’s nice to have options. But sometimes, simpler is better. If you’re looking for a bare bones digital blood pressure monitor that’s super easy to use, look no further. Panasonic’s EW3109W is the most user friendly blood pressure monitor on our list. It’s the perfect choice for anyone look for a hassle-free way to check their blood pressure. One touch operation. You won’t need to dig through the instruction manual to figure out how to use this device. Just press the button whenever you want to get a reading. Built-in memory saves your last 90 readings. When it comes to monitoring blood pressure, it’s important to be able to look at trends. This device’s built-in memory allows you to do just that. It comes with a carrying pouch. If you want to carry this monitor with you, just wrap the cuff around the monitor and slide it in the carrying bag. The large display is easy to read. The large display makes this blood pressure monitor a good choice for people with vision problems. It doesn’t come with an A/C adaptor. This blood pressure monitor does feature an A/C adapter plug, but you have to buy your own A/C adaptor if you want to plug it into an outlet. Though the EW3109W doesn’t include “gee whiz” features found on other blood pressure monitors, it does its basic job quite well. 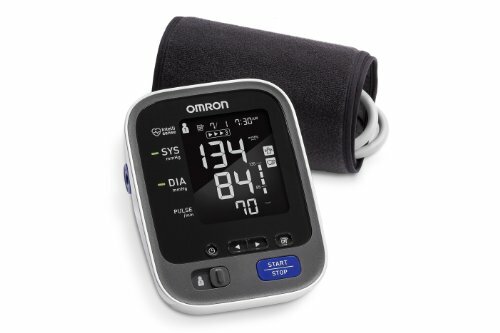 If you’re looking for a modern, digital blood pressure monitor with tons of cutting edge features, Omron’s BP786N or BP785N are better choices. Digital blood pressure monitors have lots of interesting features. But if all you want to do is take a simple blood pressure reading, an old-fashioned aneroid sphygmomanometer may be more your speed. 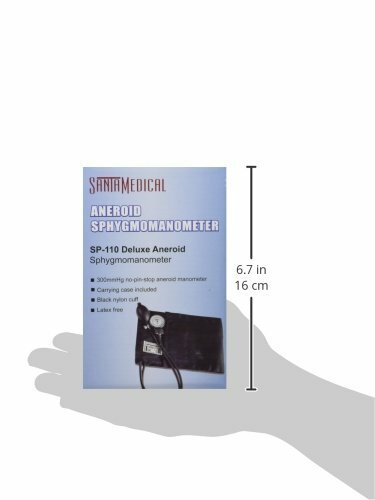 As long as you keep it calibrated, this aneroid sphygmomanometer will provide you with highly accurate blood pressure readings. 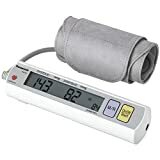 It’s one of the most popular sphygmomanometers on Amazon. This product has great reviews, plus it’s inexpensive compared to other sphygmomanometers. No batteries necessary. You don’t need electricity to use this monitor. Comes with a discreet carrying case. The carrying case allows you to easily bring this blood pressure monitor with you wherever you go. Affordable price. This is the cheapest blood pressure monitor on our list. This manual blood pressure monitor lacks the features found on most modern digital blood pressure monitors. Also, you have to manually calibrate this device yourself if you want accurate readings. If you’re looking for a good manual blood pressure monitor, this offering from Santamedical won’t disappoint. As long as you know how to use one properly, this type of device is capable of delivering very accurate readings. 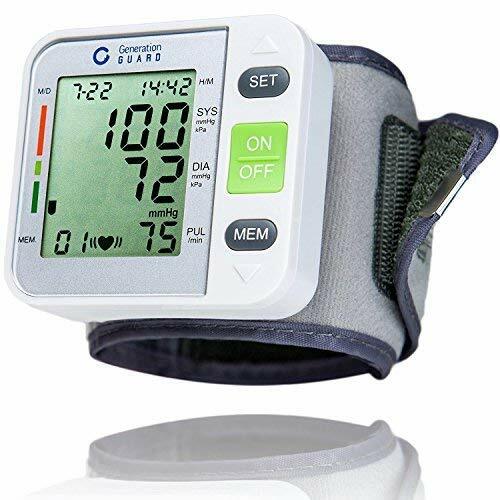 If you prefer a blood pressure monitor which you can wear on your wrist instead of your upper arm, you might want to think about this one from Generation Guard. It is compact for easy storage, and also has great features for ease-of-use and accuracy. The screen is large and easy to read. While there is no backlight, most users will have no trouble seeing their readings at a glance. Fits a variety of wrist sizes. You can use this monitor if your wrist size is anywhere from 5-9”. Most customers will find it comfortable and will discover that it inflates easily. Choose your units. Both mmHg and kPa are available. See both your blood pressure and heart rate at the same time. Be alerted about irregular heart beats. If the monitor detects an irregular heartbeat, it will let you know. Store up to 90 readings. This is an impressive feature in light of the relatively low price range for the monitor. A lot of models in this price range offer little or no storage. Fast and easy to use. There are just three steps to getting your reading. Start by strapping on the monitor. Sit in the correct position, and then press the power button. You will get your reading within 30 seconds. A few units may produce readings which are not accurate. This is almost a universal flaw with home blood pressure monitors, so calibrate yours to make sure it is working properly, and always make sure you are positioning your arm correctly and following all directions to the letter. 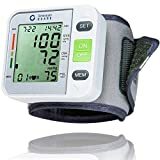 When it comes to a reasonable price, ease of use, and ample storage space, it is hard to beat this wrist blood pressure monitor. Generation Guard is an excellent buy on a budget, and should serve you well if you take the time to get accurate readings.